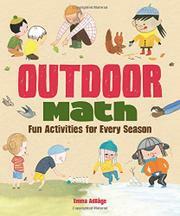 A Swedish author encourages kids to get outside and explore math. Focusing on the four basic operations as well as sorting, counting, patterning, geometry, odd and even numbers, and time, AdBåge divides the book into four sections by season, providing five to seven activities within each that are a mix of solo and group endeavors. Using rope, kids can cooperatively make geometric shapes. Bowling with plastic bottles as pins works addition skills. Fallen twigs make for a good game of pickup-sticks. How many snowballs can be packed in a minute? While some of the activities listed emphasize both the outdoors and math, most do not. Several can be done inside just as well, and many require that children collect and paint or otherwise mark natural materials. Some directions are not complete enough to be followed easily, while others seem just to add extra steps so that the author can claim it’s an outdoor game. All of the winter suggestions require snow (in short supply in many climates), and throwing rocks at a tree target is just asking for ricochet injuries. Backmatter includes rudimentary directions for “plus and minus” and “multiply and divide” as well as a list of activities by math skill. Some of the illustrations appear strangely unfinished, a few characters lacking facial or hair color while around them are mostly pink faces, and the opening spread about numbers is missing illustrations for four of the 11 numbers.